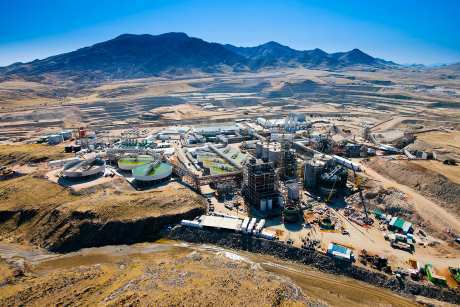 Langer Heinrich produced 3.4 million pounds U3O8 (1308 tU) in 2017 from the processing of stockpiled medium-grade ore: physical mining activities were curtailed at the end of 2016. However, these stockpiles are expected to be exhausted before mid-2019. A decision as to whether to restart physical mining, process low grade stockpiles, or place the operation on care and maintenance must be made at least six months before the stockpiles become exhausted, Paladin said. "Given the continued deterioration of macro factors, including the stubbornly low spot uranium price but also factors such as foreign exchange rates and prices of processing reagents, it's becoming less likely that the Company will be in a position to resume physical mining activity at LHM [Langer Heinrich Mine] in 2018, nor would processing low grade stockpiles be viable," the company said yesterday. "As a result, Paladin has commenced preparatory steps towards being in a position to formalise a care and maintenance decision with relevant stakeholders." Paladin believes it will be in a position to make a formal decision on care and maintenance within the next two months, subject to receiving any necessary approvals and completing preparatory initiatives. Consultations with relevant stakeholders including government, customers, joint-venture partners and employee representatives, and other preparations including changes in certain supplier arrangements and staffing, have already begun, the company said. Uranium production would cease one to two months after a decision is made. Paladin CEO Alex Molyneux said the uranium market had failed to recover since the Fukushima accident of 2011, with average spot prices so far this year the lowest in 15 years. "It's deeply distressing to have to consider suspending operations at LHM because of the consequences for our employees, and the broader community. However, as there has yet to be a sustainable recovery in the uranium market, and with the aim of preserving maximum long-term value for all stakeholders, it is clearly prudent to consider these difficult actions," he said. Western Australia-based Paladin entered administration in mid-2017 but recommenced trading on the Australian Securities Exchange in February, following the successful completion of a recapitalisation which saw Deutsche Bank become the company's biggest shareholder after buying debt in the former entity from French creditor EDF. The company's Kayelekera mine in northern Malawi has been under care and maintenance since 2014.